If you want to eat at Barbecue Junction, even on a week day, please make a booking. Their centralized reservation system will book a table for you at any of their outlets. 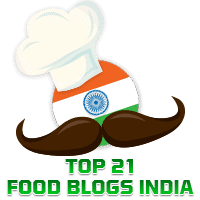 We booked a table for two at their JP Nagar, Bengaluru restaurant for a birthday lunch for my husband recently. It was a Wednesday afternoon but the place was full up. Let me start by saying that you need to have a huge appetite if you are to do full justice to the spread laid out before you. We generally have the starters to our fill and go straight on to the desserts on offer. Naturally, there is a main course on offer too which we usually skip! The menus below give you an idea of what is in store. They are not as strong in their spellings as they are in the food they serve. I am glad it is not the other way around! 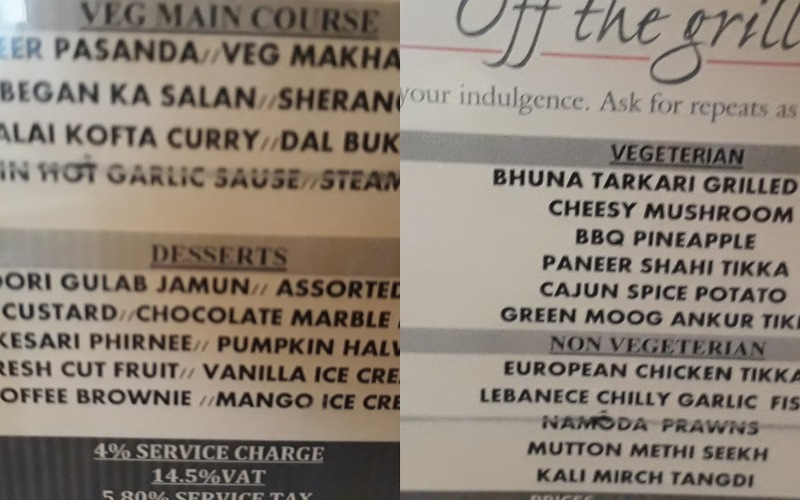 The non-vegetarian starters were wholesome and delicious, especially the prawns and the fish, We had a choice of chicken, fish, mutton and prawns. For the vegetarians there were starters with mushroom, corn and pineapple as far as we could make out. The mojito which came as a complimentary drink with its minty and lemony flavours was most refreshing. The service was prompt and efficient. The starters were replenished quickly with new ones on the hot grill placed on our table. As accompaniment to the starters were various dips and sauces which you chose to match the starter you were having. After a leisurely lunch, we headed to the dessert counter. We had chocolate brownies, vanilla ice cream with chocolate sauce and some mango ice cream skipping the gulab jamuns, pastries, and fresh fruit. Last but not the least were the kulfis. Again there was a wide variety to choose from. 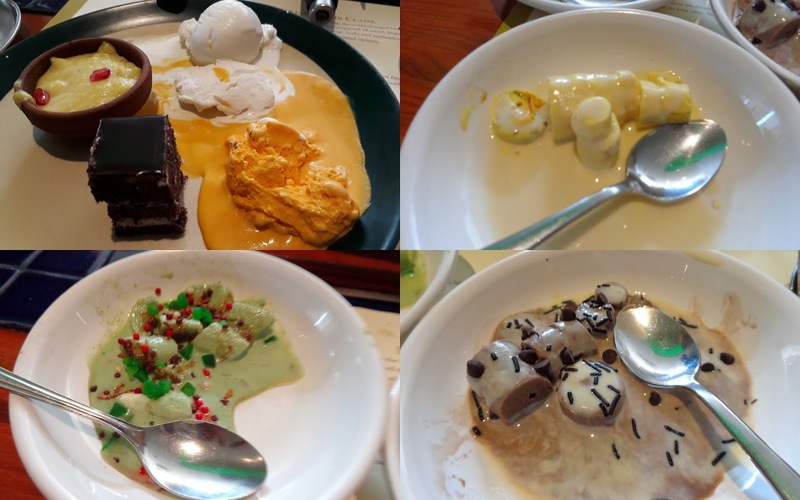 We sampled the chocolate kulfi, the kesar and badam kulfi and the best of all the pan kulfi. I must mention that since I had told them it was my husband’s birthday when I made the booking, they had rustled up a cake with his name on it and the staff gave a robust rendition of their own birthday song! The approximate cost for a meal for two is Rs.1800/- All in all, we came away very satisfied with our experience at Barbecue Nation and would most happily recommend this to you.